In EDN Issue 72, we asked readers how chaya grows in various climates; whether or not it is accepted locally as a green vegetable; and if so, how it is usually prepared and served. Thank you to those of you who responded! We received reports from many different countries. Chaya has been found to grow remarkably well in a wide variety of climates. Nancy Harper, working in Belize with Systems of Sustainability, wrote, “We have used chaya for the last ten years as our principal and preferred year-round source of greens. It tolerates lack of care, quite a bit of shade or full sun, and invasion by weeds. Few pests bother it, it is highly resistant to just about everything, and it produces a prodigious amount of leaves, even in the dry season, if given a little compost and mulch. “After a few years, if not mulched or given compost, chaya can begin to die out, especially during prolonged drought. I believe it is a [viral disease] carried by an insect. As soon as I see these insects on the underside of the leaves and note the fading, sickly leaves, I take cuttings from the healthiestlooking plants and replant them in good soil with compost and mulch. This only happens when plants are heavily cropped, underfed, and dry. Charlie Forst, Appropriate Technology specialist here at ECHO, pointed out that for maximum production of tender leaves and 4 to 6 inch new shoots, you should pollard chaya (i.e. cut back the larger limbs and upper canopy to about 4 feet) rather than coppicing it (cutting back the whole plant, including the stem, to around 18 inches). Tim Bootsma with CRWRC-Zambia wrote to us about how chaya grew in Eastern Province, Zambia. “We received the chaya cuttings in January, 2000. They all arrived safely. They were potted and all six cuttings grew well. Two got eaten by my dog, though; she liked to dig in flower pots. By March the [rest of the] plants were ready to plant out. “In Zambia we have a four-and-a-half month rainy season that begins in mid-November and goes till the end of March. Then we get no rain until the following November. Our chaya plants were ready for transplanting in March, just at the end of the rains. “Three plants survived the transplanting and early care. These three were planted in three different locations. One was way up on a dry hill, the second toward the high end of a gardening area (where water is close to the surface), and [the third] in a wetlands/lowland area. They all grew well until this past rainy season, when the one in the lowland got waterlogged and died. The other two did better, with much more vigorous growth on the one grown in the garden area in reach of more soil moisture. “The one in the high area kept getting attacked by local chickens. At times it was plucked bare, with no leaves left but just a stem. It struggled, but it survived. Grant Kaufmann wrote from Villamontes, Tarisa, Bolivia, “Dear ECHO, in response to your question about chaya in EDN: We have subsequently started chaya at two locations in Bolivia: 1) Santa Rosa, 17 S latitude, tropical wet/dry (three month dry season), 1500 mm [60 in] precipitation, 300 m [1000 ft] elevation and 2) the Chaco, 21 S latitude, subtropical dry (six-month dry season), 600 mm [24 in] precipitation, 600 m [2000 ft] elevation. Marsha Hanzi at the Instituto de Permacultura da Bahia, Brazil, wrote, “I brought chaya stakes back from an ECHO conference some years ago, and I now have enough to give away as many as people want. It has adapted to our garden in tropical Northeast Brazil, and also to the drylands, when planted in the vegetable gardens there. It is always a bit puny the first year, but takes off after adapting to the new site. 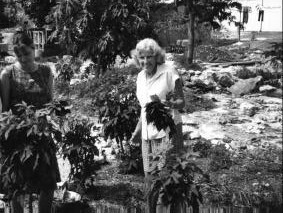 Figure 2: Susanna Hall (left) and Ruth Beverly picking chaya at the Old Bight Mission Home on Cat Island, the Bahamas. Photo by Danny Blank. Chaya also has done well on Cat Island in the Bahamas, where the ground is mostly limestone, resulting in very difficult growing conditions for plants (see Figure 2). Since the picture in Figure 2 was taken, the chaya plants have grown to more than six feet tall. The leaves are harvested once every two weeks and prepared in a soup to be served to about three dozen orphans and workers at the Mission Home. Is chaya locally accepted as a green vegetable? It is encouraging to read about chaya’s vigorous growth in different climates. But chaya’s value is limited unless people actually use it as part of their diets. We wanted to know how chaya was accepted locally as a green vegetable. Jay Ram (Hawaii) said, “Interestingly, a wild variety of chaya (with stinging hairs and narrower leaves) was introduced to Hawaii some decades ago by the government as an alternative perennial vegetable. It never became popular (no doubt due to the stinging hairs), but can still be seen growing wild in the form of trees in some places..
James Golden added that a new variety of chaya without the stinging hairs was introduced into the area of Belize where he lives and works. He demonstrated to many people in the area that this chaya didn’t sting, by placing the bottom side of the chaya leaf on his arm and witnessing the amazed expression of his neighbors! Tim Bootsma in Zambia wrote, “Chaya was cooked up and eaten by our volunteer agriculture promoters—13 people in all. They all liked it very much and want to grow it in their gardens this year. John Freeman wrote that in Nicaragua, “About half the folks hate it, but others love it. I plan to work on drying chaya leaves to be added to soup, as (it) may taste different and be accepted by all. The traditional dish is a sort of rice and meat soup called “luk-luk” in the Miskito language. It could use some vegetables, so I hope to introduce chaya leaves as an addition. Indeed we can! Some of our readers wrote to let us know how they or people in their area typically prepare and serve chaya. Perhaps these ideas will inspire experimentation by others! Nancy Harper in Belize said, “Central Americans usually fry the leaves with eggs and tomatoes. But I prefer to boil them first to be sure to remove HCN [Ed: the small amount of poison boils off as a gas]. The cooking water is a delicious tea, warm or cold, and is very good for high blood pressure. The boiled leaves can be drained (and squeezed if you want to remove all the water) and served like spinach, or fried with oil, salt, onions and garlic. Peanut meal or peanut butter is a very good addition, as are mustard, soy sauce or miso. The leaves are also good cooked in coconut milk with ground foods like potatoes and yams or breadfruit. “Our favorite sandwich is to spread peanut butter on a warm cassava and flour tortilla, pile on the cooked chaya, and roll it up like a burrito. The cooked leaves can also be put in any kind of tortilla or bread dough. All children will eat bread or tortillas and can thus get their greens at the same time. Chaya can be used in any recipe that calls for cooked spinach, including lasagna and even pizza! The stem tips are very delicious, boiled and peeled. You can cut about 4 to 6 inches, depending on growing conditions. Remove the tough, longitudinal fibers after cooking. Marsha Hanzi in Brazil said, “We eat it here as kale is eaten: cut into paper-fine strips, and stir-fried with garlic and ginger. [It needs to be cooked] longer than kale because it is more fibrous. I imagine that the very very fine cutting helps to dissipate the acid. It is delicious this way…” Sometimes chaya is blanched before it is stir-fried. “David Kennedy (Leaf for Life) also points out that it is excellent as a source of dried leaf meal [as a nutrional supplement]. It could be an excellent addition to animal feed in the dried form as well. Chaya cuttings will be available from ECHO in May, 2003. Our current stock is low due to the discovery of a virus in our chaya plants; several months ago, we discovered that most of our chaya plants contain the common cassava mosaic virus (CCMV) (Note: this is NOT the same as the common cassava virus that can devastate cassava crops in Africa!). We know of no published studies indicating that CCMV can jump from chaya to other crops. A study we read indicated that around 70% of chaya trees sampled in the Yucatán (believed to be the center of origin of chaya) carried CCMV. Chaya (presumably with CCMV) has been grown on ECHO’s farm for twenty years, but to our knowledge our cassava plants remain virus-free. Nevertheless, we would rather send out virus-free cuttings. We have virus-free plants, but they are still too small to provide cuttings. They will probably be ready by April or May). We are also working with a tissue culture scientist at College of the Ozarks to culture virus-free plants by meristem tissue culture.